I know it's a bit cliché to cycle on the day the Tour De France starts, here in the UK where I live. It's a bit like going for a run on the day of the London Marathon (in my fit days that was an annual habit of mine), picking up a racket when Wimbledon starts, or going football mad during the World Cup. BUT cycle today, we did indeed! Very sad to hear about what happened to Mark Cavendish, but delighted about all of the publicity the Tour De France has deservedly brought to Yorkshire. Today, the weather was BEAUTIFUL - not too hot and far from cold. 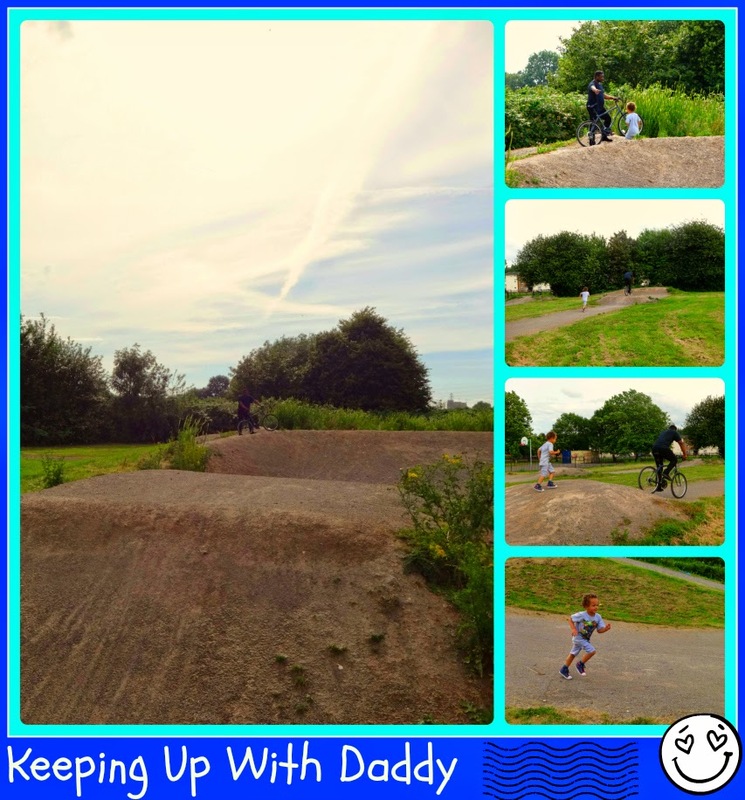 We took the opportunity to run for the hills - literally - and introduced Daddy to the BMX track we found the other day. Rather predictably he did all of the big humps and bumps that are out of me and Aaron's league. To be honest, as small as my bumps are (oooh err) they felt like a roller coaster to me, and I felt brave traversing them! Being that Aaron's only been on a proper bike (no longer a balance bike) for a couple of months, our bumps are in his comfort zone too. Of course, they did our track together a few times, before Daddy moved over to the dare devil bumps. Was lovely to watch them cycling together and once I had some photos and footage I joined in too of course. Two million people turned out to watch the start of the Tour De France today. I have a new found respect for cyclists now that I cycle with Aaron. I walk my bike up hills (due to a lack of fitness) and down hills (due to the fear factor) and those participants always make it look so easy. I will say though that when I am riding alone, feeling the breeze, despite it being hot, I literally feel at one with the world. I notice it every time I cycle back from dropping Aaron at nursery. It's a short cycle ride (I should find a way of making it longer) and I enjoy every second, like time stands still. I literally hear the birds sing and a calmness envelopes me. Definitely great for my breathing too. My gout doesn't hurt when I am cycling either so it's all good! Cycling is something the hubby and I often did together on our his and hers bikes before Aaron was born. 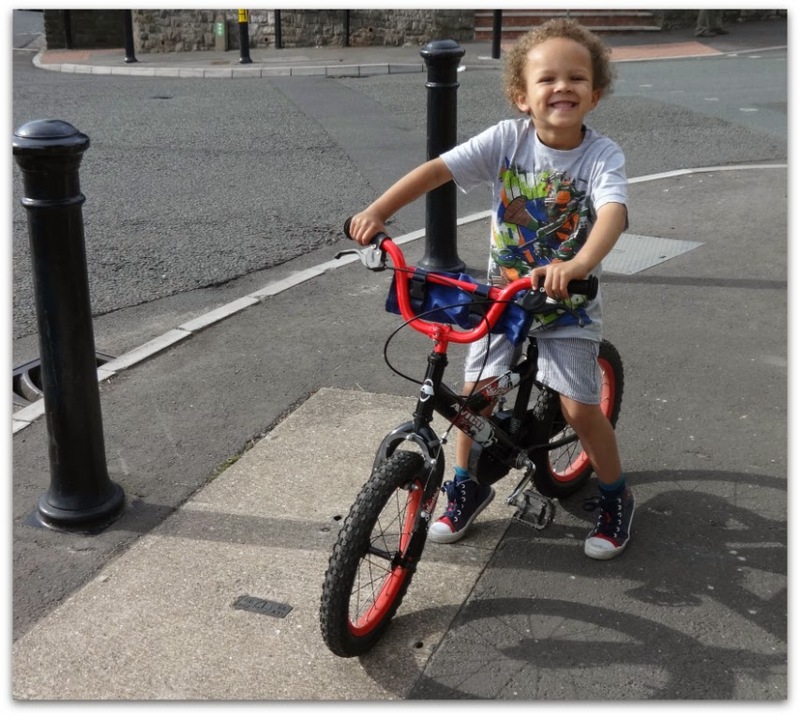 When he got his balance bike I only joined him on my bike I think twice. Yet since he started cycling proper, we literally go everywhere on our bikes. It's something that we do as a family now too, and some of my happiest moments are when the 3 of us are out together on our bikes. Pavements can be scary as there are driveways and side roads to worry about, so we do a parent sandwich where one of us checks ahead and the other takes up the rear. Aaron's really great at listening to instructions and is very road aware. It's at times like this that I am glad I don't drive, as we get about so much more, and are so active as a result of our walking and cycling here there and everywhere. Hasn't benefited my figure in any way. I am still a size 18, but it does mean I have a good tan LOL! 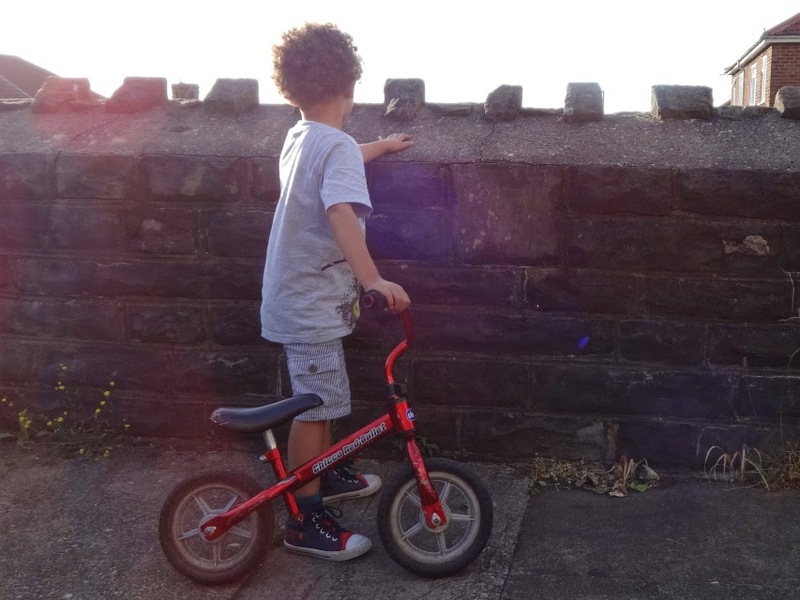 Aaron cycles on a 16 inch Avigo Mischief and it's perfect for him. We got it on promotion at Toys R Us. I am actually surprised to see his full forefoot on the floor in that photo above, as just a couple of months ago when we bought it, he was on tippy toes to reach the floor. The seat is literally on the lowest setting (to help him settle in to it, which he actually did immediately) so there's plenty room for him to get a couple of years out of this bike (fingers crossed). We seem to have a red theme with his bikes. Not intentional. The balance bike is Chicco and was bought in Kiddicare. I can't recommend it enough to be honest. It's WAY zippier and cooler than those wooden ones. When it was shiny and new, kids (even teenagers) all used to stop and look at it. It's not expensive either so you don't mind that you only get 10 months to a year out of it. Anyway this cycling mad girl needs to get her head on a pillow. It's 1:18 a.m. now. I am going to backdate this post though, so that all of the "today" references make sense for Saturday 5th July 2014.